Nearly 100,000 children in England are living in temporary accommodation after being made homeless, new figures show. At the end of June, 66,980 individuals or families were registered as having no home of their own - an increase of 12% from the same date last year. Almost a third of them had lost a home in the private rented sector. Homelessness charities blamed housing benefit failing to keep pace with rent rises - but the government said there was a "strong welfare safety net". Most homeless families with children are living in self-contained accommodation - where there is sole use of a kitchen and bathroom - the government figures show. But more than 2,500 are living in bed and breakfast accommodation - 25% higher than a year earlier. Of those households, 830 have been in B&Bs for more than 6 weeks, 36% higher than a year earlier. Samantha Ashby's children have never really known a permanent home. About 17 years ago the family was evicted by a landlord who was selling up. The same thing happened again a few months ago. Still on the waiting list for a home with Bexley Council that she says she's been on for six years, Mrs Ashby, 40, is in temporary accommodation above a shop in Northumberland Heath with her two teenage sons, Billy and Zack, and her five-year-old daughter Millie, who sleeps on a mattress on the floor of her bedroom. "I do feel like we have spent most of our life living out of boxes and bags. We have never really had our own place," she said. "It's been really hard. It leaves me feeling like a bad mum - I can't even keep a roof over my kids' heads. "I would just like for me and my family to have the opportunity to rent a fairly-priced social housing property - somewhere that we can go and stay and not worry that someone is going to sell it and turf us out. "It's OK for the people who have had the right-to-buy, but I just don't like that it's left people now without anywhere to go. The social housing that there was has gone. There's nothing left to borrow, let alone buy. "I just want to wake up and find myself at home, wherever that is." The figures showed that, in total, 99,080 children were among those living in temporary accommodation. The statistics do not include rough sleepers but the most recent data suggests there were about 2,700 people living on England's streets in autumn 2014. Hannah Gousy, of homelessness charity Crisis, said: "Unfortunately, what today's statistics are showing us is that 30% of people who are being accepted as homeless are homeless because they are losing their home in the private rented sector and unfortunately the cost of housing benefit simply isn't keeping pace with market rents and that is making it extremely difficult for people." 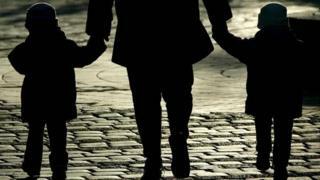 Javed Khan, chief executive of children's charity Barnardo's, called the figures a "national embarrassment". He said: "Day in, day out, Barnardo's works with vulnerable families and young people who've been pushed into rent debt because of low wages. "Benefits changes have left them unable to cover the costs of essentials." Campbell Robb, chief executive of Shelter, said the figures painted a "grim picture of the devastating impact welfare changes and sky-high housing costs". The Department for Work and Pensions said the number of households living in temporary accommodation was "significantly lower" than the peak in 2004. "Temporary accommodation ensures no family is without a roof over their head," said a spokesman. "We continue to spend around £24bn a year on housing benefit, so there is a strong welfare safety net in place." In Scotland, 34,605 households applied for homelessness assistance in 2014-15. In Wales, a total of 1,350 households were threatened with homelessness between April and June, according to the most recent statistics, and there were 1,935 households in temporary accommodation at the end of June. A total of 18,862 households informed Northern Ireland authorities they were homeless in 2013-14. According to the latest figures, the number of households accepted as statutorily homeless was 9,649.